It would be difficult to describe any film featuring a giant lizard as realistic, but this newest Godzilla entry exalts so much in the sheer spectacle of havoc and destruction that it paints a pretty convincing and awe-inspiring picture. The trouble is that it does so at the expense of much in the way of story or character, reducing its leads to mere observers who flit in and out of danger but leave little impression and therefore generate little suspense. A prologue introduces Joe (Bryan Cranston), a scientist living in Japan who loses his wife (Juliette Binoche) in a disaster at the nuclear plant where they both work. 15 years later, their military son Ford (Aaron Taylor-Johnson) visits and finds his dad still obsessing over the event and the belief that the government is keeping something major under wraps. They discover the truth together when they investigate the site and a huge winged creature emerges from the wreckage. This MUTO (or Massive Unidentified Terrestrial Organism), as it's known, unleashes mayhem and its presence somehow leads to the legendary Godzilla being awakened from the depths of the ocean. The beasts converge in Ford's home city of San Francisco and begin to stalk the coast, while an admiral (David Strathairn) and a couple of experts (Ken Watanabe and Sally Hawkins) try to figure out how to stop them. Ford volunteers his services in the mission, as his young son and wife (Elizabeth Olsen) attempt to stay out of harm's way. 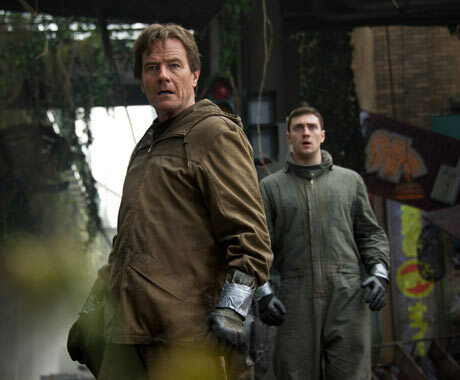 You would expect that after what director Gareth Edwards was able to accomplish in his low-budget theatrical debut Monsters, the effects here would be first-rate, and the film doesn't disappoint in that respect. The design and movement of the creatures are fully realized and captivating, though the combination of 3-D and the prevalence of night scenes cause a lot to remain hidden in murky shadows. Also, at a certain point it does seem as if scenes consist of only gob-smacked reactions to the carnage and set-ups to the next attack, with only a sequence involving a bridge and a train building any genuine excitement. If its greatest crime then is trying to show off and leave fans with mouths agape, then it's hard to fault Godzilla too much. It's certainly much better than Roland Emmerich's 1998 abomination. So what if it might be lacking a little of the emotional connection that's required to actually thrill? It still has to be considered one of the world's greatest VFX demo reels.